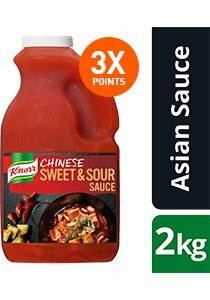 A sweet and tangy Asian sauce with pineapple and capsicums, perfect for noodles, spring rolls, braised dishes and stir fries. It’s also great as a dipping sauce. Sauce for noodles, spring rolls, dipping sauce, braised dishes, stir fry. Weight - 2 kg. Weight per serving/portion - 80 g.